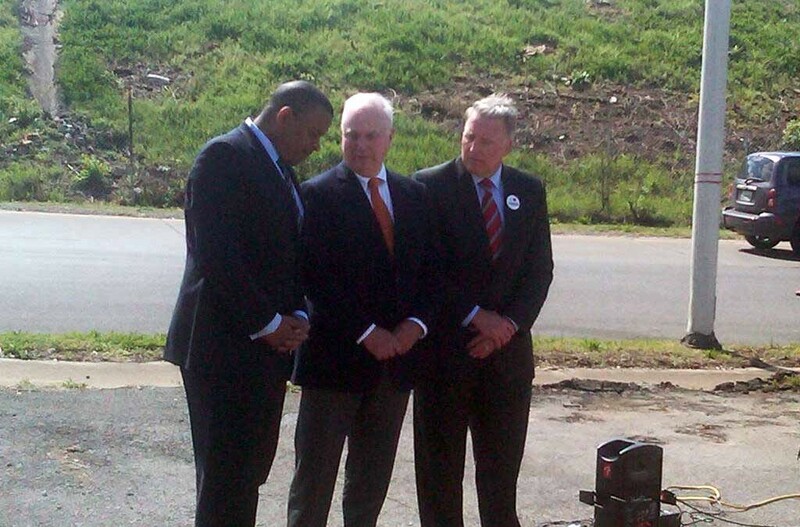 Pictured above: 2013 ARTBA Chairman Steve Wright, Wright Brothers Construction talks with Secretary Foxx (left) at an event in Tennessee. U.S. Transportation Secretary Anthony Foxx commenced April 14 a five-day, eight-state road trip entitled “Invest in America, Commit to the Future,” to demonstrate the value of federal investment in transportation and to warn Americans of the upcoming Highway Trust Fund (HTF) revenue shortfall. Foxx made stops in Columbus, Dayton, and Cincinnati, Ohio; Louisville, Ky.; Nashville, Tenn.; Atlanta, Ga.; Anniston, Birmingham, and Demopolis, Ala.; Jackson, Miss. ; Shreveport, La. ; and Dallas, Texas. Foxx’s grassroots campaign is highlighting the local impact that insolvency of the HTF would trigger later this year. Foxx is pushing states to increase pressure on Congress to solve the looming HTF revenue shortfall, and encouraging local leaders to see the value of a long-term solution rather than the stopgap measures Congress has enacted in recent years. During his Nashville visit, Foxx spoke alongside former ARTBA Chairman Steve Wright, president of Wright Brothers Construction Co., Inc., at the site of a local bridge that has been closed three times in the past year due to concrete chunks crumbling onto cars and the roadway. Wright noted that 62 percent of Tennessee’s highway and bridge spending comes from the federal government. “I would encourage and ask every one of you to take a few moments and to reflect upon the transportation dollars that you spend at the gas pump and remember that there’s such a thing as good government spending,” said Wright.